Around this country, in fact around the world this is a time of great upheaval and change. The economy of almost every nation is at risk, and the everyday people of the nations are in even greater jeopardy. In Europe…Ireland, Portugal, and Spain (among others) have hit a period of economic turmoil. In Greece they are fighting a period of austerity to be ‘saved’ financially by the European Union. As ordinary citizens we are being forced to find new ways of surviving this period. Many of us are without jobs, and even without unemployment benefits. Many of us may lose homes, spouses, families, security, and/or all loving support. One of the things that I have been advocating for several years is the return to the coping methods of the WWII period. It was strongly encouraged during this period to grow what was then known as a Victory Garden. If people are not hungry, they can cope with other issues with more clarity of mind, and less despair. Back in June of 2010 I wrote and published the following piece on just this subject…. “During World War II when food and so much else was rationed, people made their ration stamps for food go further by growing Victory Gardens. Today when there is so much pressure on us all to cut back our family budgets, going back in time and revisiting the Victory Garden seems a wise idea. If we just shuffle through our memories from last summer we would dredge up the salmonella scare on fresh fruits and vegetables. By growing our own, we eliminate that threat to our families. Two very good reasons to plan a garden now…. plant it…. tend it…. and harvest it. It is time to stop complaining about rising food costs and try and do something for our own benefit for a change. It is time to stop looking to the government and big brother for the next fix. Our new president is doing everything in his power to help the American people come through this economic crisis. They are even planting a garden on the White House grounds this season…If the Obamas can do it, why can’t you? An idea I was toying with was encouraging everyone to write Mr. President, request him to remind people about the Victory Gardens of the WWII era, and ask him to encourage the American people to follow his lead in just that effort. The rest of us can go to our local Town Councils and ask for Community Garden Space to be made available. We can grow more than we need, and knock on the single mothers door down the street, or the aged guy in the apartment complex where your elderly mother lives (you know the kind of people I mean!) and share your produce. Some food banks even accept produce that is locally grown, call, and find out if your excess can feed someone else this year. Someday you may need the same help! Many of us have already cut expenses to the bone…. 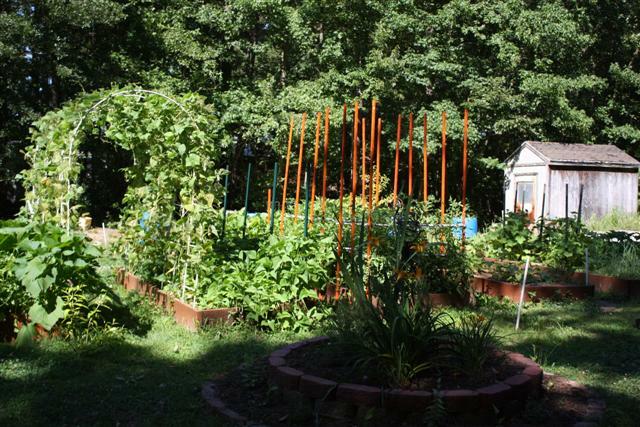 we own no credits cards, no loans, drive as little as possible, cut the car insurance back to state legal limits, have cut off cable or satellite TV, and have started our own Victory Garden…. We are making the effort to conserve…how about joining us? My husband and I have been working on expanding our garden. We have done a ton of hard work, and have more to go. The garden has doubled in size since last year. The varieties of plants have grown, and some plants neither of us have ever grown are experiments in the garden this time. Come help us sort through a garden of fresh produce…medicine and food from one source! All summer maybe I can share our plants, our trials and solutions, and our eventual outcomes! Great to see this email this morning. Being I think a bit older than you, My past down gardening experience and knowledge base learned from my elders goes back to the 1860’s – 70’s, 2 world wars and a 10 year depression in there as well. To a time that gardens and canning excess fruits and vegetables could mean the difference in having a full stomach or going to bed hungry. I am a strong believer in prior planning prevents winter hunger.